Banarasi lassi is very different from Punjabi lassi. While Punjabi lassi is a frothy drink with a blob of fresh white butter floating on top, banarasi lassi is more like a dessert drink. I remember having a frothy fresh punjabi lassi served in huge metal glasses when i was a kid . That lassi used to be lightly sweetened and a little thinner too. I liked the kachhi lassi (which is actually fresh buttermilk) more as i like all things savory. In punjab villages lassi, seet or savory is always served with some fresh white butter floating on top. Lassi of banaras is poles apart from that refreshing drink of punjab. It is more a filling meal in itself, a dessert meal in fact. Thick and sweetened with a topping of malai on top and a generous blob of rabdi over it. How much more sinful it could get? The mithai loving people of Banaras have reinterpreted the lassi for sure. The curd for this lassi is made with reduced milk so the lassi gets a nice creamy texture . 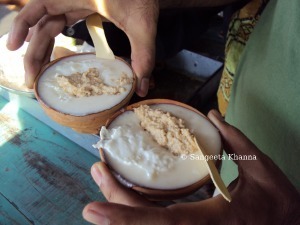 The curd is set in to wide vessels called parat as seen in the picture here so it gets a larger layer of malai on top. Look how the shop owner is pouring lassi straight from the matka in which he jut churned the lassi using a wooden mathani (an Indian whisk) . I remeber in olden days these parats were not used to set the curds and there used to be nice earthen vessels of the same shape and size. I am not sure if the milk is boiled in the same vessels as when the milk cools down all the fat floats on top and makes a nice and thick layer of malai . 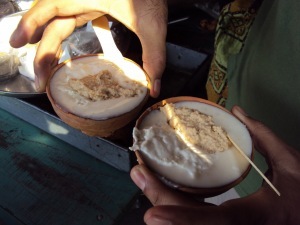 The same malai is scooped off to top the lassi when served in earthen kulhads. Yes, these kulhads make this lassi even more special.I am so glad these kulhads and dried leaf plates and bowls are still used in some of our cities. 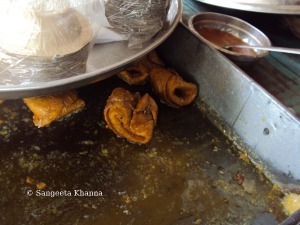 Look at the dried leaf bowls they use to serve those syrup dripping lavag-lata . Lavang-lata is a very sweet fried pastry stuffed with clove flavored khoya( reduced milk) and dipped in a very thick sugar syrup. A bengali version of this sweet is lavang-latika which is smaller in size and delicate in folding pattern, the bengali version includes some coconut too in the stuffing. This particular place is famous for it's lavang-lata too and you can see there stock is almost over by afternoon. And now is the time to introduce you to the special place where you can get this treat. This is pehelwan ki lassi situated at Lanka crossing. This area is close to the Banaras Hindu University and if you are coming from the university side you can spot this shop on the right side of the crossing, flanked by a hardware shop. The lassi here is one of the best in Banaras , a few places in chowk and Ramnagar make great lassi too but it's very easy to get duped for a glass of lassi in banaras. Banaras is known for it's thugs too you must remember so you need to spot the right place to try the famous and talked about specialties of the city. Many of my friends in the past have had lassi from nondescript places and have got upset stomachs as many of the shops use synthetic milk and yogurt so beware. When something is famous from a place, there are more chances of imitations or cheaper versions available to dupe the tourists. Same goes for Banaras silk but i am not talking about that right now. This lassi would surely make you want to come back to this shop several times during your visit i am sure. There are other nice places for good lassi too and i would share those places whenever i get an opportunity. Oh the lassi...did i describe the taste for you? It is actually better than any ice cream of the world. That granular looking rabdi is unsweetened to balance the intensely sweet lassi below and that piece of malai should be devoured slowly. One because it is so laden with fat that it fills your palate and two because it is so yummy you would want it to last till the lassi lasts in your kulhad....so have a spoonful of rabdi and take a sip of the lassi then take a spoonful of malai and take a sip of the lassi...and do not laugh at the way i am describing it as i have learnt it the hard way how to eat and drink this lassi at the same time....when you try to drink it straight away those edibles block your sip and you get confused what to do.... those small wooden spatulas are there for a purpose. Go to Banaras or recreate it ...lassi is a natural healthy drink , often a meal in a drink for me. Try the bada kulhad (a large portion) here and see what i mean. This one was a chhota kulhad ( smaller one) which cost us 15 Re each....can you believe it? How much calories are going into it? 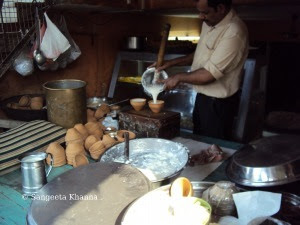 Anyway the pictures do look mouth watering and I had no clue that banaras ki lassi is so rich.Thanks for posting. banaras ki lassi is irresistable n hearty.. 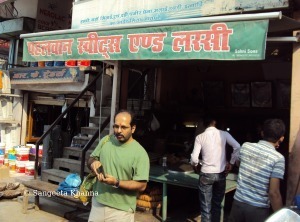 Recently I was touring Varanasi and had lassi at Blue Lassi Shop, Kachowri Gali. It was one the best lassi I had till-date. And then at Pahalwan Sweets, Lanka crossing I had Launglata - another delicious sweet. Thank you Banaras.